Exclusive volunteer programme giving future whale scientists the opportunity to study these amazing animals in their natural habitat. 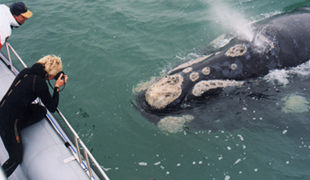 Southern Right whales including calves arrive in July and leave in December for Antarctica. Other species include Humpback whales, Bryde’s whales; Bottlenose, Pacific Humpback and Common dolphins as well as Great White Sharks, Cape Fur seals and African penguins are resident all year. Accommodation is provided in our comfortable, self-catering house close to our headquarters at the Great White House from which tours depart and research is co-ordinated. Every volunteer becomes an integral part of the team ensuring that you maximise the opportunities for time at sea in one of our three boats. Weather permitting, there are usually two trips a day to visit the whales. Every trip is accompanied by a resident marine biologist. We always observe and record whale behaviour as well as collecting photographs which are added to our extensive database and shared with scientists around the world. An individualised programme is developed for each volunteer and the majority of sea time is spent aboard our vessel, Dream Catcher. Dream Catcher will launch 1-4 times per day when conditions and bookings allow. Volunteers will be scheduled on trips depending on the numbers of volunteers/space on the boat for 1-2 trips per day where possible. Volunteers will have the opportunity to collect and enter data and photograph behaviour. Volunteers will enjoy lectures from our marine biologists as well as guest speakers from local organisations and universities with whom we work closely. Lectures will include ocean conservation, basic seamanship, shark biology and behaviour, data collection and the work of the Dyer Island Conservation Trust. You will have the opportunity to shark cage dive during your time here.